Diamonds, diamonds, diamonds! Horse lovers delight. 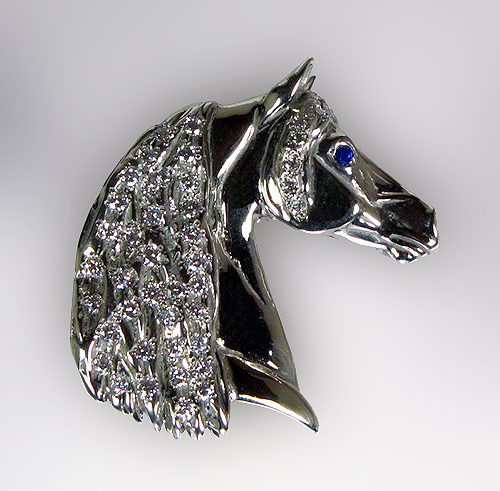 The Gorgeous Horse is your source for horse jewelry. Check out this Morgan beauty. A wonderful piece offering incredible detail any horse lover would desire. Featuring full cut diamonds set in the mane and forelock to express exquisite detail crafted from 14 kt white gold, top it off with a sapphire in the eye. Dimensions: 1 1/2 inches tall X 1 1/2 inches tall. Set with 1.87 carats of round cut matching diamonds and a 2mm diamond cut sapphire in the eye. Make this beautiful Morgan head anyway you want it! Special request welcome below!